The problem with a lot of gym focused wearable tech, is it requires you to buy the correct fabric to go with the environment you’re planning to work in. If you’re headed out to Alaska to bike the mountain roads, you better choose performance gear designed to insulate your body. If you’re headed to the Sahara desert, you better choose fabric that wicks away your perspiration and offers plenty of airflow to cool your skin. But who are we kidding? There is no perfect environment. In the real world, it may be freezing when you first start out to run, but after several minutes your body is overheating, so you slow down and then get cold again. Or you could start a baseball game when it is nice and warm, and by the seventh inning stretch the sun has fallen and the air is frigid. You could always bring plenty of performance gear to cover the gambit of conditions, or just one… the Vaiden Triton Heliosphere. The Triton works from the same technology designed by NASA to help regulate the body temperature of its astronauts. 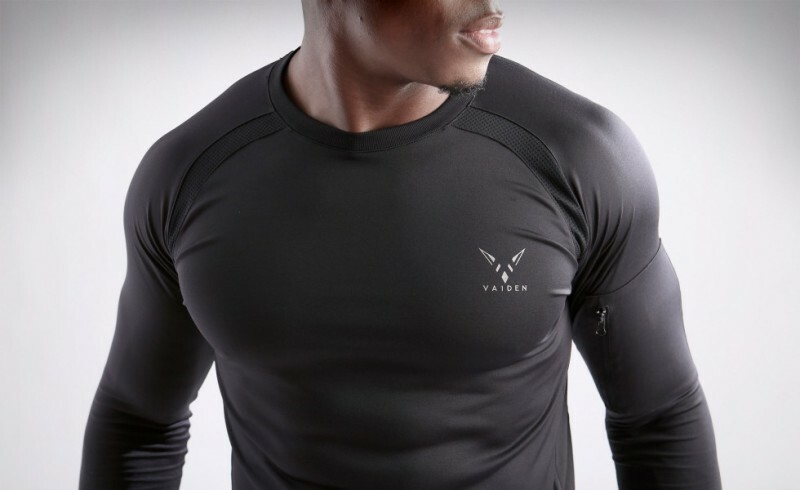 In other words, it stores excess body heat inside tiny polymer Thermocules as you workout. Then as your body starts to cool down, it helps to keep your muscles warm by releasing the warmth back into your body. Makes perfect sense to us. Get yours here.